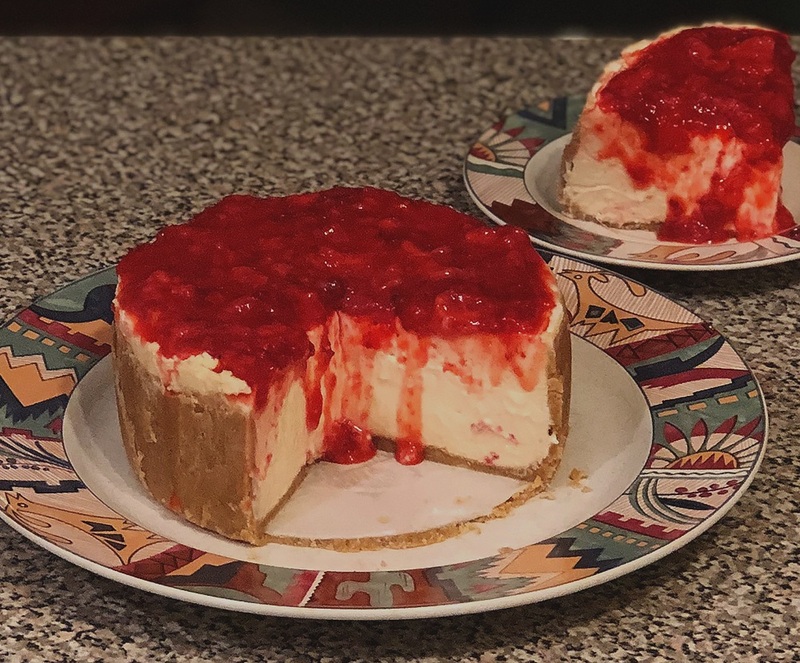 6 inch cheesecake pan (it will fit perfectly in a 6qt instant pot). Add parchment paper around bottom attachment of pan. Cover insides and bottom with butter. Add aluminum foil around outside of pan to cover the bottom and prevent cheesecake from pouring out. In small bowl- mix together almond flour, melted butter, sugar, and salt. Add mixture to greased pan and pat down crust with fingers around bottom and sides so each area is even. Place in freezer while mixing cheesecake mixture. In medium bowl with mixer or use your KitchenAide mixer with paddle- Mix together cream cheese, sugar, sour cream, eggs, corn starch, vanilla extract, and pink Himalayan salt. Grab prepared crust from freezer, pour cheesecake mixture into pan. Cover top with aluminum foil to prevent water from saturating cheesecake during cooking process. Add one cup of water to bottom of instant pot. Place pan on trivet that sits in the bottom of the instant pot. Carefully sit the trivet and pan with cheesecake in the bottom of the instant pot. Cover with lid. Seal. Pressure Cook setting (or in my case, manual setting) and cook for 30 minutes. Once it’s cooked let it sit for ten minutes before venting. After ten minutes move to vent. Then remove from instant pot and let cool for about 30 minutes at room temperature. Cool remainder of the way in the refrigerator. It is ideal to leave it for at least 4-6 hours before cutting. Loosen sides with knife before pushing Cheesecake out of pan. Time to enjoy or you can top with fruit, chocolate, or topping of choice. Note: if the trivet does not have handles on each side to make it easier to pull the cheesecake pan out of the instant pot, you can make handles with aluminum foil.